Those people who live in the countries that experience heavy snowfall know how difficult and tedious it is to clean the snow off form their cars. The process of cleaning the snow is not only time-consuming but it is also not good for the cars as it takes longer for the car to start in that whether due to the snow. For protecting your cars and saving a lot of time cleaning it there are portable garages or carports available in the market. These portable garages or commonly called as carports are available in many sizes and colors. The carport is like a shelter that can be kept for covering the car in the snowfall. The carports are generally fully enclosed and are spacious enough to fit one car at a time. These carports are the multi-function shelters as it can also be used for other purposes as well. Make sure that the carport you are buying is water resistant and can be fixed anywhere. The most attractive characteristic of this carport is that it is portable so you can carry it along with you on trips as well. After going through all the options for carport i have curated seven best options for the carports that are affordable and of good quality. 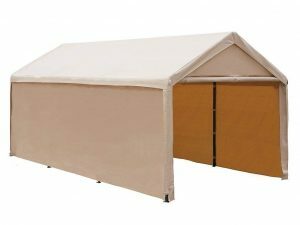 Abba Patio High duty beige carport is one of the highest rated carport available online. The best feature about this carport is its size: 10 x 20 foot which is spacious enough to cover your cars during a heavy snowfall. It also has a heavy-duty steel frame that is powder coated and is 1-½ inch in diameter. 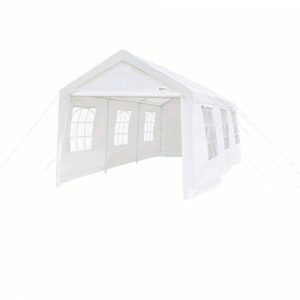 This carport is portable which makes it suitable for carrying it along with on the trips or events. 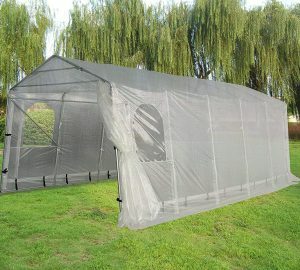 It can be used for other vehicles such as motorcycles, boats or even for horse shade as it is huge enough to cover all these. As the frame have powder coating it is resistant to corrosion, chipping, peeling and rust. The carport is made up of a double polyethylene fabric which UV-resistant as well as water resistant helping to protect your car against heavy snowfall, rains, and wind. It is very easy to set the carport by following the instructions that are stated step-by-step in the guidelines. It can be placed on a concrete or semi-concrete surfaces such as lawns, road, etc also there are foot pads installed to the canopy legs that offers stability to the anchor. King Canopy Hercules carport shelter is a premium quality carport. It is 12 ft x 20 ft which are sufficient for keeping a car as well as other vehicles in the snow. The cover is can expand to a size of up to 20 x 20 which can be used for events or gatherings as well. It is versatile with simple side zippers. It also includes white leg covers for a fancy appearance. The carport shelter has is made up of polyethylene completely. The carport is UV-resistant, water resistant and fire resistant. It is also great for gatherings, short trips, and events. 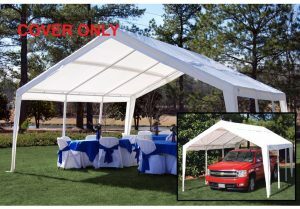 The canopy is the perfect replacement for the worn out and old canopy. Shade tree heavy duty carport is one of the large carport option available in the market today as its overall size is 20ft x 30 ft. This portable garage is made up of waterproof 180 gm polyethylene woven fabric canopy along with the sidewalls which give complete protection to the car in the heavy snow load. The heavy-duty framework is along with spring-loaded locking balls providing it the strength. The carport has removable side walls along with the windows with lattice. The end walls of the carport also have zippers for doorways which makes it convenient to use it as a portable garage. It gives protection against the sun rays as it blocks 90% rays of the sun. The carport has high strength galvanized metal joint fittings. Bestmart heavy portable garage is a compact carport that is fully enclosed. Its overall size is 10ft x 15ft x 8ft. As it is quite large it can be used as canopies in the parties and events. The high-grade steel frame with the powder coat finish helps in resisting the chipping, peeling, and rust. The frame also provides the stability to the carport. It is also resistant to the corrosion. The carport is waterproof and UV-treated. It is also anti-fungal, anti-yellowing and anti-aging. It is made of polyethylene material with the PU coating on its top. It is perfect for automobiles, vans, trucks as well as for bulk storage. The carport is very easy to install. 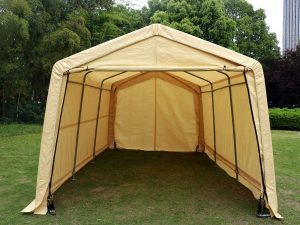 Quictent heavy duty carport has the multi-functionality as it can be used for small parties, events, and gatherings due to its large size. The carport is washable which makes it very to easy to clean it. The heavy-duty steel frames are powder coated which gives it resistance against water. The window design in the carport allows more light in it and is also good for the ventilation. 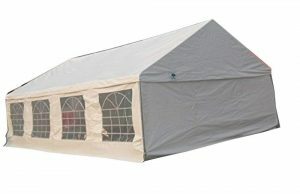 As the sidewalls are removable it can also be used as a canopy in the summertime. The main covers and doors of the carport are made from long-lasting Poly. The manufacturer assures lifetime free replacement for connectors, pegs, ropes etc. It also comes with a 1-year warranty for covers and poles. The PE material used in the fabric of the carport is tear proof, waterproof and anti-UV. This cover is an industrial grade cover which has long lasting durability and protection. 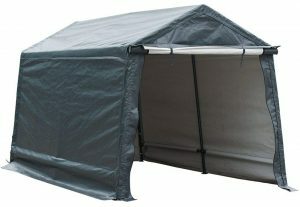 It also features a zipper on both ends of the carport for the better ventilation. Vingli carport uses high-quality galvanized steel to give the maximum stability to the carport. It also uses powder coating on the steel tubes that are rust-resistant and also helps in giving the longevity and the durability. The carport is waterproof and UV proof. The manufacturer of this carport is ISO standard certified and is a premium quality portable garage. The carport has six transparent window sidewalls and two zipper doors which makes it very convenient to use. The material used in making this carport is 140g polyethylene which gives it a longer lifespan. The connecting part and the foot base is also made up of the premium quality steel. There are bag buckles that allow in rolling curtains along with the crossing structure at the top of the tent to give it stability in the bad weather. 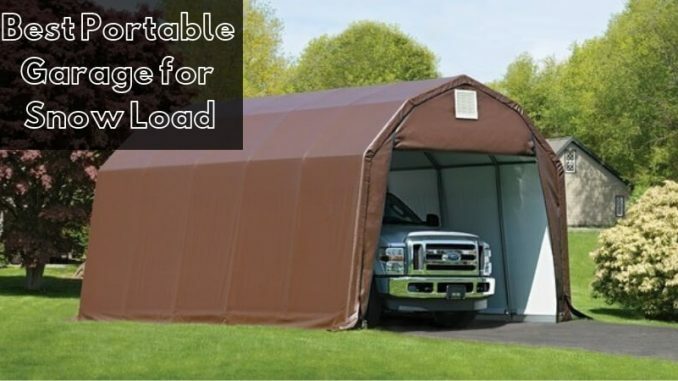 The sidewalls are removable and the carport can be used as a canopy. Abba Patio is the top-rated manufacturer in the carports as their carports are of an excellent quality. This particular carport is of the size 7ft X 12ft which is perfect for keeping a car in it. It has powder coated steel frames that are resistant to chipping, peeling, corrosion etc. This carport is completely enclosed that helps in protecting against sun and wind. This carport is very easy to set up and can be easily taken from one place to another with the help of all the instructions given with it. It has a detachable zipper door that can be removed when required for using it in parties or events. The carport is made up of premium quality polyethylene that helps in preventing water, UV, and fade. It gives complete protection against snow, rain, and wind. There are foot pads attached to the canopy legs for easily accessing the anchoring points. These above-stated carports are very to install and set up. Most of the options stated are huge in size and can be used for other occasions as well or using it to store the things in the shelter. These are versatile outdoor products which have more than one use. You can select the carport you would want to buy based on your size and use of the carport preferences.